I am very passionate for what Mud Puddle Girl stands for. And it’s really not about playing in mud~ but making a splash! 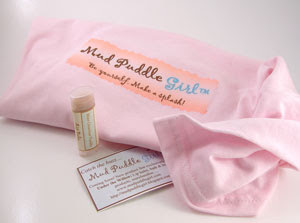 One of the 1st products within the Mud Puddle Girl line will be: Mint Chocolate Puddle/ lip balm. Pure ummm…used your recipe, then tweaked it to call it my own. The lip balm is quite tasty and leaves a little zing on the lips because of the mint that MPG‘s have added to the straight chocolate lip balm. But, staying true to the Chocolate Lip Balm project (click here to see the final recipe), MPG really did include chocolate in the lip balm. Thanks for the samples and for liking the Choco-Balm recipe enough to make it your own. Go see Mud Puddle Girl’s site here. As for me, I’m going to sit here smacking my lips all night! Congrats Carrie~Gigi!!! Your website is absolutely beautiful and your blogs, which I have been reading for awhile, are soooo much fun to visit. Aww…thank you Anne-Marie. I will be honest~ you were the 1st person I wanted to send a Mud Puddle Girl t-shirt to, because you are really an inspiration & true to the Mud Puddle Girl “theme” ~ you are making a splash! So, thank you.